For more than 30 years, sedation using benzodiazepines, combined or not with opioids, has been used as a standard regimen for gastrointestinal endoscopy; it is usually referred to as traditional sedation. Sedation management in gastrointestinal endoscopy varies between European countries according to the different legal frameworks and different healthcare systems. In the majority of European countries, endoscopists administer sedation with support from endoscopy nurses, while in some countries such as France only anesthesiologists administer intravenous sedation. In some countries any sedation can be administered by all trained clinicians, while in other countries administration of propofol can only be performed by anesthesiologists. Therefore, because of national legal restrictions, non-anesthesiologist administration of propofol (NAAP) has been established in only a few European countries, including Austria, Denmark, Germany, Greece, the Netherlands, Sweden, and Switzerland [1–9]. Irrespective of the type of sedation used, quality management requires pharmacologically appropriate training for all clinical staff involved in sedation practice. Individual qualifications, human resources and technical requirements have already been addressed in different guidelines [5, 10–17]. The German courses based on the national sedation curriculum combine sedation and emergency management, irrespective of the agent used for sedation (e. g., propofol, benzodiazepine, or combined medications) . The nationwide implementation of these courses has significantly improved quality with regard to structure in German gastrointestinal endoscopy departments . In Denmark, a training program for procedural sedation and analgesia (PSA) has been implemented in the capital region in cooperation with anesthesiologists ; sedation quality was found to be high following the implementation phase of NAAP in an endoscopy suite . Therefore common training practice standards for all methods of sedation used in endoscopy have been shown to be beneficial in improving clinical practice as well as structural quality. 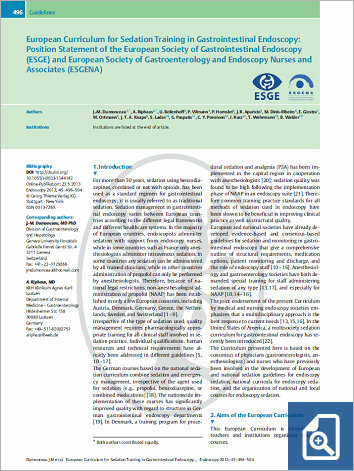 European and national societies have already developed evidence-based and consensus-based guidelines for sedation and monitoring in gastrointestinal endoscopy that give a comprehensive outline of structural requirements, medication options, patient monitoring and discharge, and the role of endoscopy staff [10–16]. Anesthesiology and gastroenterology societies have both demanded special training for staff administering sedation of any type [13, 17], and especially for NAAP [10,14–16]. The joint endorsement of the present Curriculum by medical and nursing endoscopy societies emphasizes that a multidisciplinary approach is the best response to current needs [13, 15, 16]. In the United States of America, a multisociety sedation curriculum for gastrointestinal endoscopy has recently been introduced . The Curriculum presented here is based on the consensus of physicians (gastroenterologists, anesthesiologists) and nurses who have previously been involved in the development of European and national sedation guidelines for endoscopy sedation, national curricula for endoscopy sedation, and the organization of national and local courses for endoscopy sedation.